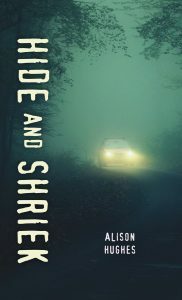 Hide and Shriek: When Emily, Tess, Cam and Dylan decide to ignore the new town curfew during their Friday-night game of hide-and-seek, they get more than they bargained for. Down by the river, they witness a shady deal go down involving some criminal types who recently moved into their neighborhood. When the teens are discovered, they are hunted through the dark streets and back alleys. They will have to use all their hide-and-seek skills to save each other. Ultimately, Emily, the youngest of the group and the best hider, discovers that sometimes staying hidden is the best way to escape. Nothing formal, but one of my children’s friends casually mentioned that he’d been part of a game of tag for several years. The group would just tag each other when they least suspected it. It made me think of how teens sometimes use games from their childhoods semi-ironically. Hide-and-seek seemed a good game to pick. After I tried being a lawyer. I shifted gears after my children were born and I stayed home with them, writing during nap times and after they went to bed. Writing was the creative outlet I’d always been looking for, and it didn’t hurt that no nylons or suits were required. There was a moment when I sat back and thought: “so how are these kids getting out of this?” And clear as day, Emily (the main character) suggested a gripping, nail-biting solution I wouldn’t have thought of. Love that girl. I’d like to try fantasy or magical realism. I love scrounging through thrift stores. Stay tuned for a story based on thrifting. Probably the most challenging part for me is the solitary aspect of writing. Finding time to be alone with your thoughts can be challenging, and when you do find time, it can be isolating. But I’ve made a number of great writing friends. It helps to have a community. The delight of creating something that children like (maybe even love) to read. The very best feedback is from readers themselves. I think the book shows how resourceful, brave and resilient children and teens can be. I’d also like reluctant readers to see that books written specifically for them aren’t only focused on lexile levels and vocabulary—great characters and thrilling, gripping stories are universal. Hide and Shriek is available now! 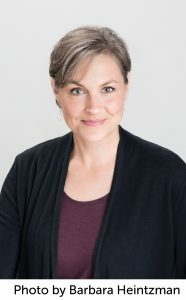 Alison Hughes writes for children of all ages. Her books have been nominated for many awards, including the Governor General’s Literary Award. She shares her love of writing by giving lively presentations and workshops at schools and young-author conferences. She lives in Edmonton, Alberta, with her family, where her three snoring dogs provide the soundtrack for her writing. For more information, visit alisonhughesbooks.com.